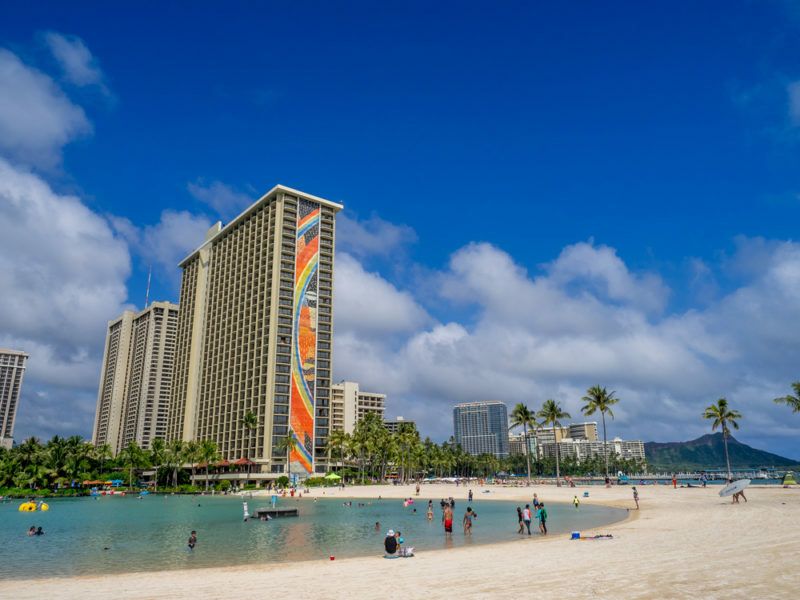 As you research Waikiki hotels on the internet, you’ll come across several opinions about whether or not you should stay in Waikiki. The ravers love Waikiki’s ocean-view balconies and sandy beaches. On the other hand, several visitors complain heavily about the crowd, noise and nonstop flow of tourists. Then you have to sift through the visitors themselves. Were they young honeymooners dropping cash for that once-in-a-lifetime luxury resort? Or was it a young family with 2 young kids, an infant and a sensitive budget? Perhaps a retired couple more interested in Hawaiian culture and waterfall views? 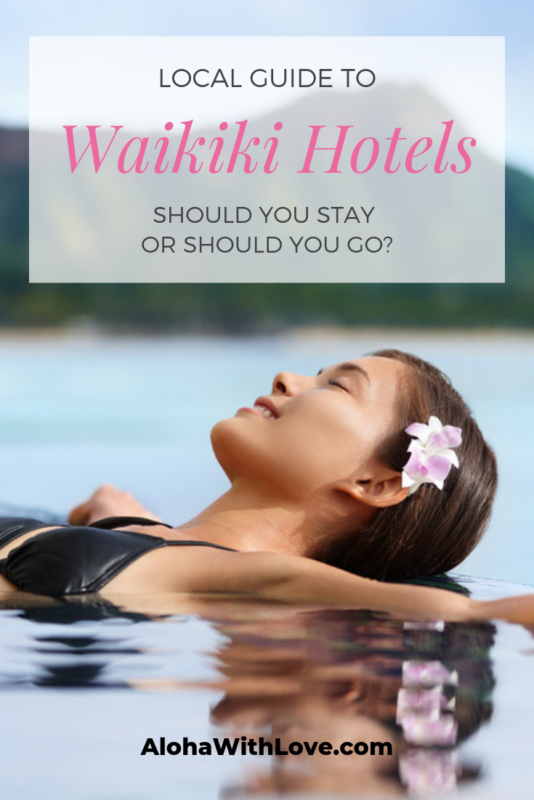 It’s difficult to know what your response to Waikiki will be since every person is going to be looking for something different, so I’ve written this post to help you to decide if Waikiki hotels are right for you! Price is pretty much on all of our minds. Here’s a very, very simple breakdown so you can get a feel for what pricing is like for Waikiki hotels. Keep in mind that there are always deals floating around and prices fluctuate greatly especially during popular seasons. Studios just outside Waikiki (but still in Honolulu) can be found from around $75 per night and up. There are also a few hostels available in Waikiki also starting at about $40 per night (per person). Local Tip: Last I checked, Polynesian Hostel had fantastic prices. 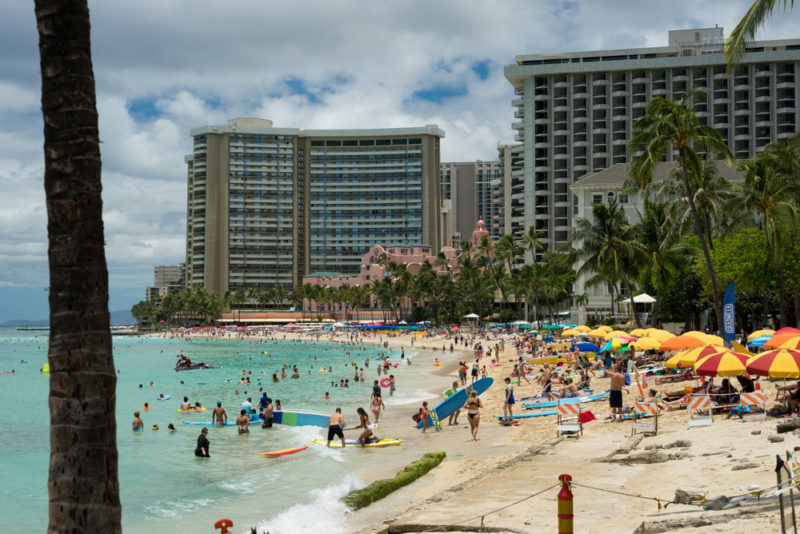 It’s possible to find cheaper Waikiki hotels for about $100 per night. These won’t be anything fancy and will probably feel dated, but they’re affordable and still convenient. Just expect to be a few blocks away from Waikiki beach. At about $175 per night, the quality of Waikiki hotels jumps up a level and you’ll find your walk to the beach to be just a block or two away. $275 and up are the big players. 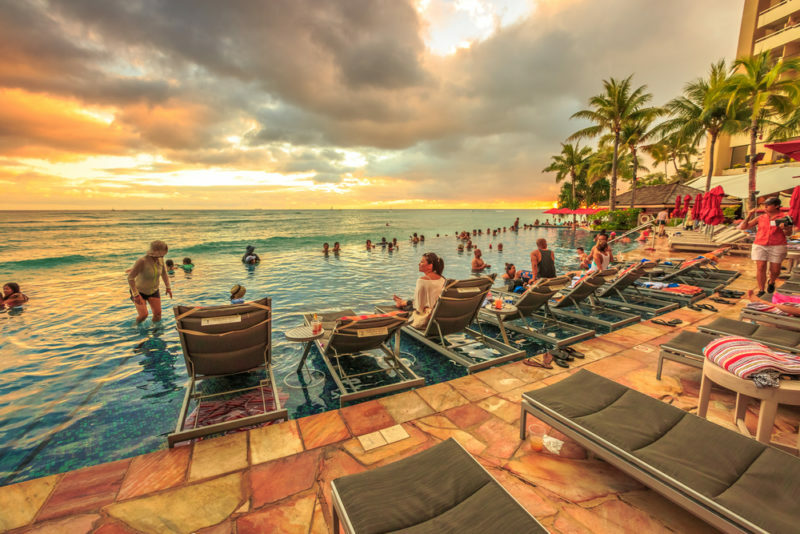 Many of these hotels are sitting right on the edge of Waikiki beach and each hotel usually has some big feature to make it interesting: mini shopping malls, infinity pools, museums and even entertainment. Don’t be surprised to see some hotels reach the $500 mark (or more). This just goes to show how sensitive prices are during peak seasons. Local Tip: I prefer TripAdvisor when researching hotels because the photos are taken by real customers. That way you know what you’re really going to get without the Photoshop confusion. Click for reviews on Waikiki hotels. Who Will Hate Waikiki Hotels? Hate is such an extreme word – and let’s face it. MOST of us aren’t that extreme. I’m a seasoned traveler and I can tell you that even though I love traveling through unexplored country roads and riding the “off-the-beaten-path” bus, cities have their own flavor of diversity and culture. In Waikiki, you’ll have our very efficient bus system and tons of transportation options. Taxis, Ubers and Lyfts will be at every corner and we even have a bikeshare program that will get you all over the Honolulu area. Waikiki trolleys also have direct routes to popular tourist spots and pretty much any Oahu activity you book will offer to pick you up in Waikiki. Then there’s the shopping and nightlife. Waikiki is a long strip mall of souvenir shops, restaurants, top-brand stores and a colorful variety of street performers. When you return to your hotel after a long day, it’s really great that you can walk outside and immediately check out artists and free hula performances as you stroll outside. Local Tip: Treat your stay in a Waikiki hotel as a base for the majority of your Oahu activities. Waikiki is only fun if you leave it. Use the nearby entertainment only for the days you don’t have anything planned (or when you return to your hotel later in the day). Your fun will dramatically decrease if you plan on only staying in your resort, avoiding all paid tours and using the strip mall and beach as your only activities. The pool in a Waikiki hotel is so relaxing. So who will hate staying at a Waikiki hotel? Did you notice that I didn’t answer the question yet? The answer is it really depends on what you’re looking for. Are you a honeymooner looking for total seclusion or did you want to show off your room service skills? Are beaches and hikes more your thing or do you like to end your nights with a romantic dinner at an expensive restaurant? Find out what your itinerary is for Oahu first, then decide on your ideal accommodation, whether it be a Waikiki hotel or out in a North Shore beach house. Foodies have some flexibility in terms of where to stay. There’s plenty to eat in Waikiki and downtown Honolulu, but there are also some fantastic local restaurants in the smaller cities, too. Many famous chefs call Waikiki home and it’s neat if you can hit several spots on your “Need To Eat” list. Local Tip: Many of Oahu’s famous local chefs can be found after hours at Sidestreet Inn – a local diner/bar with some good local food. Setting up base at a Waikiki hotel will be a great start as you eat your way through the island. 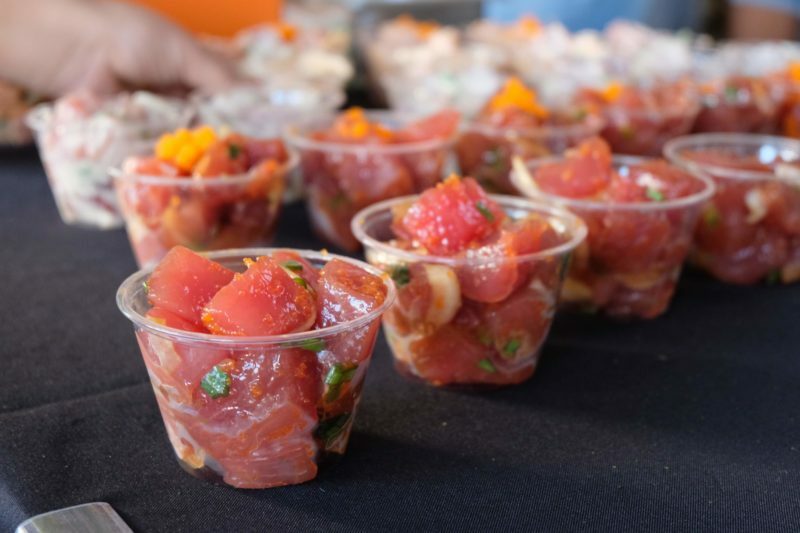 There are also a bunch of festivals held in Waikiki that will be sure to put your tastebuds to the test. Local Tip: I’ve met several Oahu visitors who have eaten every meal at mainstream restaurants like The Cheesecake Factory or Red Lobster. Take the time to look into some fun restaurants and explore! There are plenty of restaurants with skilled chefs in Waikiki. Fresh ahi poke at the PokeFest. Since Waikiki is a tourist hub, you’ll find that booking any activity in Hawaii is possible right here. There are tour agents and booths and with today’s internet, it’s easy to book online and schedule a pick up from your Waikiki hotel. 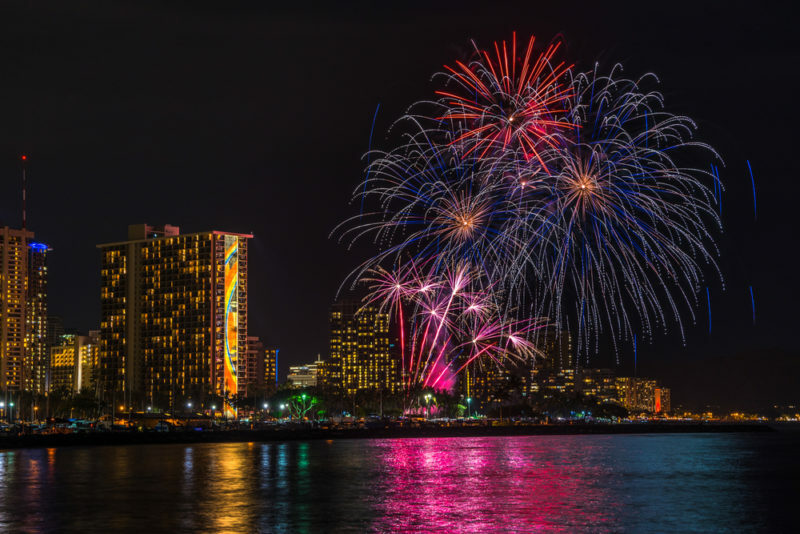 Local Tip: Waikiki fireworks are on every Friday and holidays such as New Year’s Eve and July 4. If you really want a front row seat, go for a Waikiki hotel with an ocean view. Or better yet, book a room at Hilton Hawaiian Village in their Rainbow Tower. Waikiki and Honolulu tours aren’t the only activities that provide transportation. Most tours outside of Waikiki will also have a pick-up service. North Shore Shark Adventures has an awesome cage diving experience all the way out in Haleiwa, but they’ll still pick you up from your Waikiki hotel. And if you’re considering a luau far away from Waikiki (which I highly recommend) be ready for a few laughs with your guide! The great thing about Waikiki is that you can find fun well after the sun has gone down for the night. From noisy clubs to classy bars, there’s a stop for anyone not ready for bed. Local Tip: In general, young honeymooners are the ones who need a little nightlife. Waikiki is perfect for nightclubs, quiet bars, loud clubs and late night fun walking the strip. And if you’d rather not party? Go to the beach and take a dip. Swimming in Waikiki at night is so much fun and underrated! Even jazz clubs are a thing in Waikiki. One of the more popular spots for live music is The Blue Note at The Outrigger Waikiki on the Beach. The acoustics are superb and visiting bands as well as local artists take the stage. Local Tip: Looking for more of a local flare instead of tourists left and right? Head to the Mai Tai Bar at Ala Moana where there’s a good crowd in their 20s and 30s. It’s an open-air concept with live music, a great happy hour and tasty appetizers. One of the best things about being in a Waikiki hotel are the different luxury services at your fingertips. 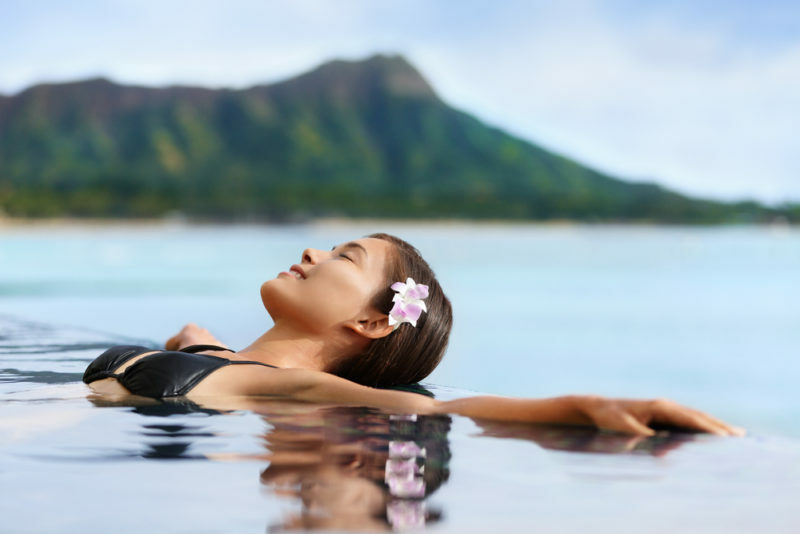 Expensive dinners, spa and wellness centers, custom treatment…it’s all here and the best part is that you can visit different Waikiki hotels and see what they have to offer. If you’re here to celebrate your honeymoon, anniversary, or are in Hawaii just to enjoy your romance, don’t hesitate to ask for a luxury upgrade. Fresh flower leis, a Hawaiian love song request, or maybe you need the staff’s help to make a grand gesture. The Waikiki hotels and their staff are open to ideas and are used to unique requests! Families with young children will find Waikiki hotels extremely convenient. There are several kid-friendly restaurants a walk away in any direction and entertainment is everywhere. There’s the Honolulu Zoo, Waikiki Aquarium, free performances, and the beach is right outside. Plus, the choice to not worry about transportation really takes the stress off your shoulders. A lot of the larger hotels (aka the expensive ones) will have activities for guests that will be perfect for kids. But if you can’t afford an expensive stay, check out the Royal Hawaiian. 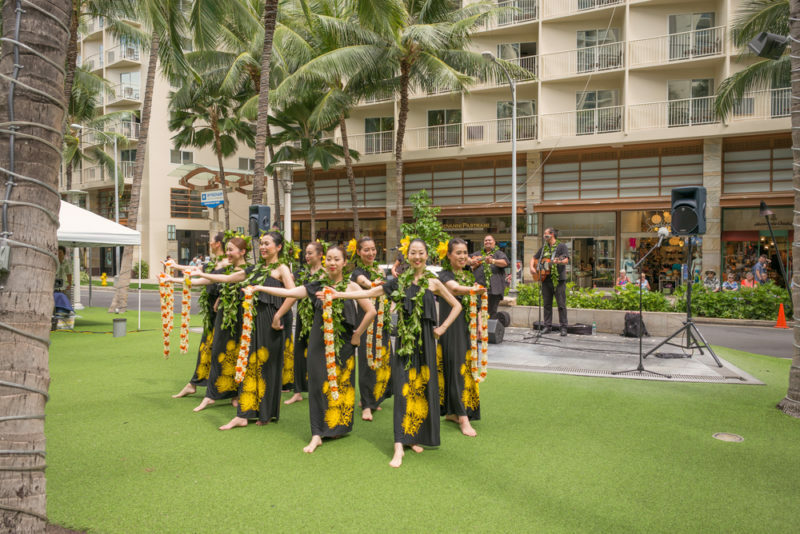 They have a range of Hawaiian culture classes that are open to anyone. Sign up quick though because classes are usually on a first come, first served basis. Local Tip: The picture below may seem daunting with the crowd of umbrellas and people littering the beach but it’s misleading and here’s why: The sand stretches past the last hotel and also behind the camera. This area is where the more famous Waikiki hotels are in the middle of the Waikiki strip. My personal favorite Waikiki beach spot would be behind this viewpoint where there are significantly less people and more open sand. Travelers who are planning to spend all day and everyday at the beach snorkeling, surfing and tanning will be better off at a less crowded location. Waikiki will be great at first, but if you plan on exploring more beaches, the North Shore might serve you better. For long-term vacationers in Oahu I recommend not staying in Waikiki for more than a week. After a week, you’ll know the island on a more intimate level and will probably want to explore the more untouched points of interests. If you can live without shopping, a nightlife and pricey dinners, maybe skip on a Waikiki hotel. I’m fine with turning in early, morning explorations, closed stores and bugs in the house (expect critters if you’re in a beach house), but that’s because I grew up with it. Figure out what you can/can’t live with and go from there. Planning On Booking A Waikiki Hotel? It’s difficult to know if you’re going to like staying in a Waikiki hotel. On one hand, there’s a reason why it’s such a huge tourist hub. It’s easy, convenient and you don’t have to plan much and can still have a wonderful time. But of course, the crowd and heavy city life does detract from the island paradise you’re probably expecting. Take into account your activities, transportation strategies, who you’re traveling with and what conveniences you can and cannot live without. For the most part, I believe everyone can enjoy at least a few days in Waikiki because of the convenience. Do all the town and nearby attractions while you’re here (there’s a lot of them) because it’s often difficult to get to them from anywhere else on the island. 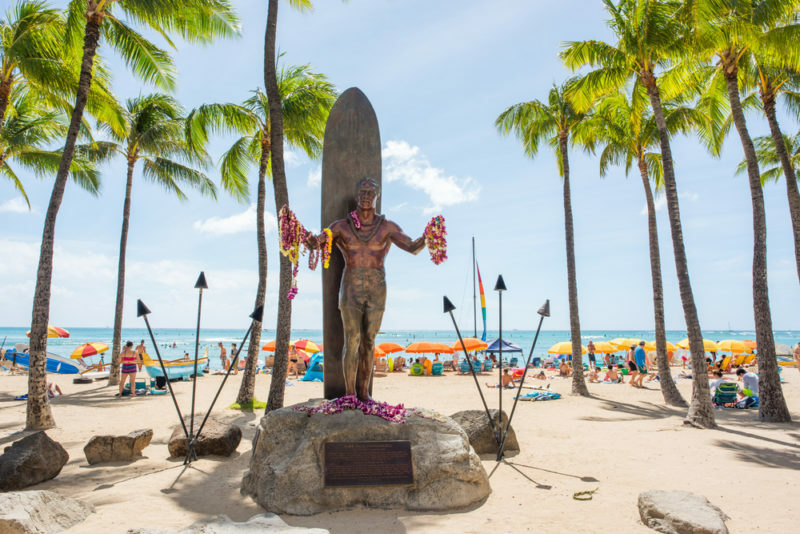 If you enjoyed this local guide on Waikiki hotels and plan to visit Hawaii someday, sign up below to get my local Hawaii tips. It’s free and I can’t wait to help you plan the perfect Hawaii vacation. How about the hotels and places to stay out on the west side? Could be helpful for folks who come with family and want to be around nature more than shopping!!! Love your blogs! Thank you for stopping by. And yes! A post on the west side hotels is on my to-do list. Mahalo!